At the turn of the seventeenth century, Hristomir Stanev argues, ideas about the senses became part of a dramatic and literary tradition in England, concerned with the impact of metropolitan culture. 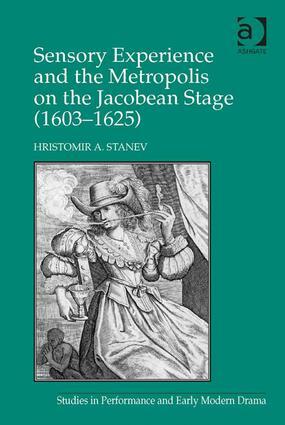 Drawing upon an archive of early modern dramatic and prose writings, and on recent interdisciplinary studies of sensory perception, Stanev here investigates representations of the five senses in Jacobean plays in relationship to metropolitan environments. He traces the significance of under-examined concerns about urban life that emerge in micro-histories of performance and engage the (in)voluntary and sometimes pre-rational participation of the five senses. With a dominant focus on sensation, he argues further for drama’s particular place in expanding the field of social perception around otherwise less tractable urban phenomena, such as suburban formation, environmental and noise pollution, epidemic disease, and the impact of built-in city space. The study focuses on ideas about the senses on stage but also, to the extent possible, explores surviving accounts of the sensory nature of playhouses. The chapters progress from the lower order of the senses (taste and smell) to the higher (hearing and vision) before considering the anomalous sense of touch in Platonic terms. The plays considered include five city comedies, a romance, and two historical tragedies; playwrights whose work is covered include Shakespeare, Jonson, Webster, Fletcher, Dekker, and Middleton. Ultimately, Stanev highlights the instrumental role of sensory flux and instability in recognizing the uneasy manner in which the London writers, and perhaps many of their contemporaries, approached the rapidly evolving metropolitan environment during the reign of King James I.
Hristomir A. Stanev is Assistant Professor of English at the University of Louisville, USA.